When a loved member struggles with dementia, the whole family is affected. It’s a range of symptoms that arise from a number of health conditions. But, the symptoms of dementia alone are enough to change the in and outs of daily life. Many aging individuals are affected by the symptoms of dementia and their families are left with the challenge of finding the best care. Unfortunately, many of these families affected by dementia think that their affected loved one needs to be placed in a home meant specifically for dementia patients. But, there are other options. And, one of those options is choosing a referral for an in-home caregiver with the experience and qualifications required to make you feel comfortable with your loved one’s dementia care. Your family doctor will diagnose and offer suggestions for treatment. Unfortunately, many cases of dementia are incurable. But, with the right care, aging loved ones diagnosed with dementia can still live comfortable lives. Unfortunately, many families with an aging loved one diagnosed with dementia believe that there is no other option for care besides a live-in facility. But, just because a person has dementia, it doesn’t mean that they have to leave the comfort of their own home. Our network of home caregivers includes individuals vetted and certified to offer caregiving services to those diagnosed and living with dementia. 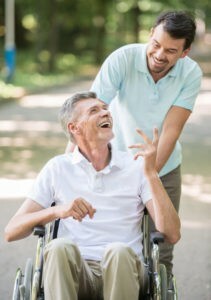 You don’t have to send your loved one to live in an assisted home. You can breathe easy knowing your loved one is safe and cared for in the comfort of their own home! If you have a loved one with dementia, we know you and your family are faced with the hard decision of treatment and dementia care. Let us help make it a bit easier on you by providing a referral for an in-home caregiver with the compassion, experience, and qualifications your loved one with dementia needs to live at home! Give Florida First Senior Home Care a call today at 561-771-5980.